1. An escape of blood from the intravascular space. capillary hemorrhage the oozing of blood from the minute vessels. cerebral hemorrhage hemorrhage into the cerebrum; see stroke syndrome. Duret's hemorrhages small, linear hemorrhages in the midline of the brainstem and upper pons caused by traumatic downward displacement of the brainstem. fibrinolytic hemorrhage that due to abnormalities of fibrinolysis. splinter hemorrhages linear hemorrhages beneath the nail. a loss of a large amount of blood in a short period, either externally or internally. Hemorrhage may be arterial, venous, or capillary. observations Symptoms of massive hemorrhage are related to hypovolemic shock: rapid, thready pulse; thirst; cold, clammy skin; sighing respirations; dizziness; syncope; pallor; apprehension; restlessness; and hypotension. If bleeding is contained within a cavity or joint, pain will develop as the capsule or cavity is stretched by the rapidly expanding volume of blood. interventions Effort is directed to stopping the hemorrhage. If hemorrhage is external, pressure is applied directly to the wound or to the appropriate pressure points. The part of the body that is wounded may be elevated. Ice, applied directly to the wound, may slow bleeding by causing vasoconstriction. Body temperature may be maintained by keeping the person covered and flat. If an extremity is wounded, and if the bleeding is severe, a tourniquet may be applied proximal to the wound. Also spelled haemorrhage. -hemorrhagic, adj. noun Bleeding, which may be pooled or active. noun A popular term for a significant loss of revenue to a provider—e.g., a hospital, physician office, etc.—resulting from nonreimbusement by third-party carriers for tests or procedures not covered by the insurer or guarantor. Medtalk noun Bleeding, which may be pooled or active verb To bleed. See Cerebral hemorrhage, Fetomaternal hemorrhage, Intracerebral hemorrhage, Intracranial hemorrhage, Lobar intracerebral hemorrhage, Splinter hemorrhage, Subarachnoid hemorrhage, Subdural hemorrhage. 1. An escape of blood through ruptured or unruptured vessel walls. Very severe, massive bleeding that is difficult to control. Hemorrhage can occur in hemophiliacs after what would be a relatively minor injury to a person with normal clotting factors. The escape of blood from any part of the vascular system. Note: also spelt hemorrhage. blot haemorrhage A form of intraretinal haemorrhage often noted in background (nonproliferative) diabetic retinopathy, branch retinal vein occlusion, carotid occlusive disease and child abuse. The haemorrhage is located within the inner retina and is limited by the orientation of the inner nuclear and plexiform layers. A small blot haemorrhage is often referred to as a 'dot' haemorrhage. flame haemorrhage See preretinal haemorrhage. preretinal haemorrhage Haemorrhage occurring between the retina and the vitreous body. It is usually large and often shaped like a D with the straight edge at the top. Syn. subhyaloid haemorrhage. Others are flame shaped and occur at the level of the nerve fibre layer and tend to parallel the course of the nerve fibres (flame haemorrhage). Retinal haemorrhages are usually round and originate in the deep capillaries of the retina. Retinal and preretinal haemorrhages usually absorb after a period of time (except those that break into the vitreous), but subarachnoid haemorrhage (which is usually due to a rupture of an aneurysm in an artery of the circle of Willis) must be suspected as they often accompany it. See proliferative retinopathy. subconjunctival haemorrhage A red patch of blood on the conjunctiva of the eye, due to the rupture of a small blood vessel beneath. The condition is nearly always unilateral and the haemorrhage absorbs spontaneously although it frequently alarms the subject. It may be associated with hypertension, especially in people over 50 years of age. See sickle-cell disease. 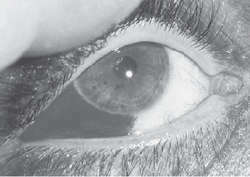 subarachnoid haemorrhage; subhyaloid haemorrhage See preretinal haemorrhage. 1. Escape of blood from the intravascular space. n the escape of a large amount of blood from the blood vessels in a short period; excessive bleeding. n bleeding in the pulp of a tooth. Such bleeding may occur during dental extractions and restorations and are often controlled by the application of a hemostatic agent. Rectal misoprostol was used for the treatment of post-partum hemorrhage in 112 women with mean age of 30. This study shines a spotlight on the critical role the immune system may play in helping the brain heal after a hemorrhage or stroke and opens new avenues for stroke treatment strategies, said Jim Koenig, Ph. Subconjunctival hemorrhage caused by diving with swimming goggles is a preventable condition. Angiographic arterial embolization in the management of postoperative vaginal hemorrhage. 3 cm in size at left T-O junction with adjacent skull bone erosion, and partial enhancement and partial hemorrhage were noted [Figure 1]a and c.
According to doctors, poor uterine contractions are the leading cause of the postpartum hemorrhage. Cerebral Native Computer Tomography (cerebral--CT), made in the emergency, showed usexactly hemorrhage lesions (appears as hyperdense on non-contrast CT). Results: Total of 50 patients having diabetic vitreous hemorrhage were included in the study. The fatal intracranial hemorrhage risk score (FICH) score was introduced to categorize acute myeloid leukemia (AML) patients based on their risk of hemorrhage .